Honda wanted to connect and engage with younger audiences, particularly those with large social media presences, and especially those with a penchant for gaming and technology, mostly men, in order to sell its Civic Type R.
Honda’s rich racing heritage was at the heart of this very ambitious project which featured the all-new Civic Type R.
The Type R is a vehicle that’s built for the track. Honda was looking for a unique way to showcase its racing chops through a campaign that would resonate with its enthusiasts as well as a gaming audience. Since most people had never gotten to drive the Type R, it was important to get that excitement behind the wheel but it actually turned out that gamers had been behind the wheel of the Type R for quite a while because it was in a lot of racing games like Forza. So Honda set out to tell a story that encompasses the full breadth of what makes the Type R spectacular in both the real and virtual worlds. To create the “R vs. R” campaign, the brand enlisted pro-Indy car driver Graham Rahal and pro-gamer Peter Jeakins. Rahal was at the top of his game in auto racing, and Jeakins was considered the best gamer when it came to Forza. To engage the largest, most relevant audience with its video, Honda developed a comprehensive rollout plan. 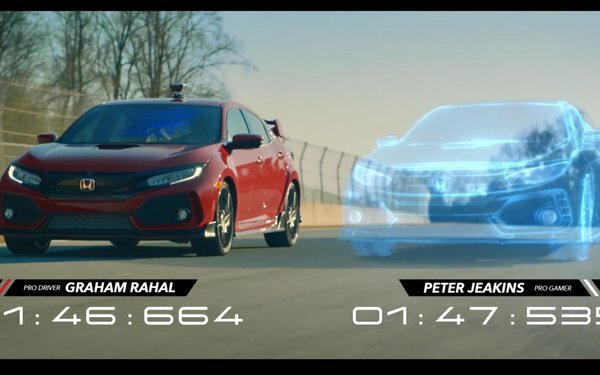 It rolled out an “R vs R” teaser content in the weeks leading up to the virtual race and utilized the hero video and great content for a month and a half across Honda’s Facebook, Instagram and YouTube pages, with the post-race content and behind-the-scenes footage rounding out the final weeks of the campaign. The automaker developed cuts with footage targeting gamers and tech enthusiasts depending on which pieces of the video were used. Additionally, it ran ads on Snapchat and Instagram Stories with a swipe-up leading to a call to action to watch the long-form video. And we leveraged the driver’s most popular social channel to drive additional awareness. Facebook Event pages are for local, not global. Honda wouldn’t recommend moving forward with those type of event pages for an online event. Longer-form content that is storytelling-driven does better on YouTube. When introducing innovative ideas, be more familiar at first and think frequency. Initially, the teaser videos were abstract with AR overshadowing the car but layering in the car visuals helped with traction. Twitter is the place for live events. Honda found Twitter out-performed Facebook so since then it has leaned heavily into Twitter as being the place for live events. Being first reaps the glory in terms of paid owned and earned media opportunity. The automaker put a lot of paid media on the front end to drive awareness and traction around the event.